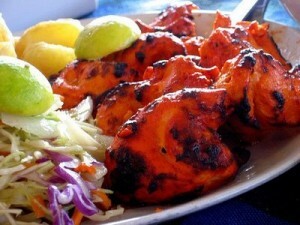 Spicy Chicken Tikka recipe by Sajida at DesiRecipes.com. Red Chilli powder 2 tbsp. Skin & bone the chicken . Cut it into 4 parts. Prick it well with a fork or with a sharp knife. Put the yogurt in a large bowl, add ginger , garlic , white vinegar , lemon juice, chilli powder, pepper & salt . Place the chicken in this mixture & marinate for 2 hours. Take out the chicken pieces & fix them on skewers. Brush them with olive oil and broil over charcoal fire for 8 minutes or more on each side. Serve it with sliced tomatoes, onion rings, lemon on a bed of lettuce. i tried it ,it waz delissious !!!!!!!!!!!!!!!!!!!!!!!!!!!!!!!!!!!!!!!!! !